My mom and dad spend a lot of time making sure the holidays are special and memorable for my children. Angelina and William love going to my mom and dad's house for Easter and love to surprise my parents with handmade treats and crafts for their table. My mom creates a tablescape with a Beatrix Potter/ Peter Rabbit theme and we add to it with Bunny treats and crafts. and simply assemble and decorate. It's fun to let the children pick out different candies and frosting every year so they can feel it's their own creation. They always have a huge discussion while planning and then again once it's done because they feel they have to claim which piece they will eat first once they bring it to Mama and Papa's house. 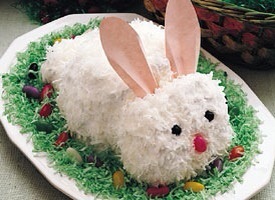 This is another type of bunny cake we tried in the past. 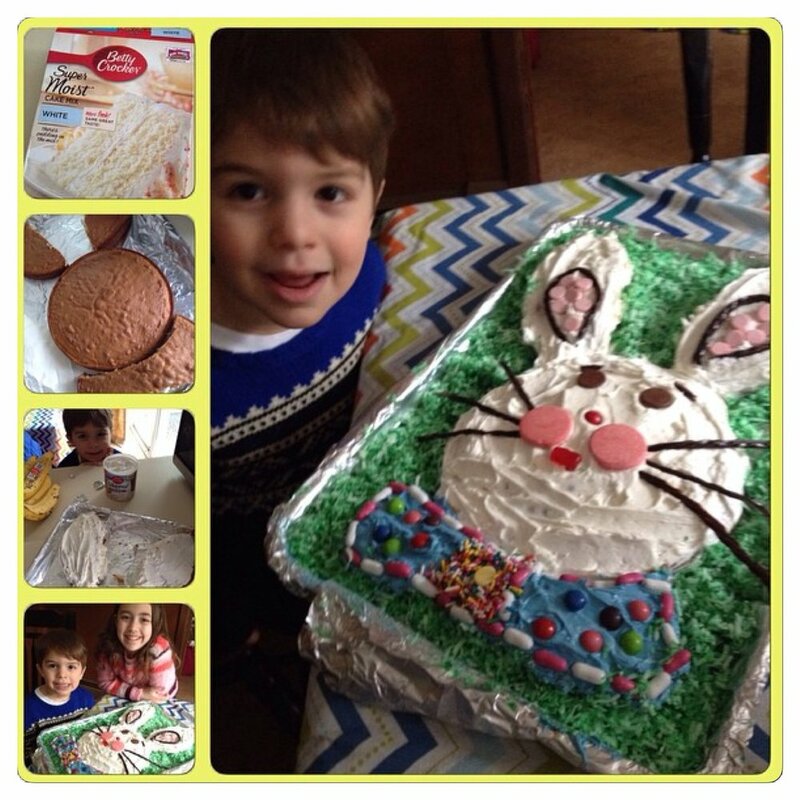 Again , just use a cake mix , cut, assemble , and decorate. This is super easy and adorable but not Angelina and William's favorite because there is not a lot of candy involved. If you are really short on time you don't even have to bake. 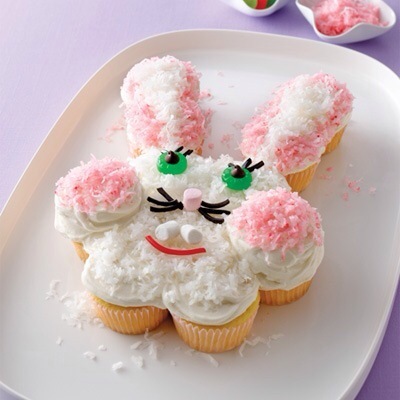 Buy cupcakes , assemble , and decorate to make this fun dessert. A few years ago I was at BJ's Wholesale Club and became obsessed with this pink cake pop maker. First of all , you don't need it. All you have to do is roll up cake and frosting into balls, put them on sticks ,dip into melted chocolate, and add candy bunny ears to make these appealing little bunny pops. And if you do have the candy ears you have to try these cupcakes. I think these are great to bring to a classroom party or when visiting around this time of year. We always make traditional Easter Eggs but we turn them into little bunnies and chicks by cutting up a paper towel roll and decorating. These make nice place cards for the table. We just write names on the top on the eggs with a permanent marker. It's super important for Angelina and William to place these on the table because they must insure seats next to my sister (Auntie Kim). Also, William makes sure he has access to the bread and lamb shaped butter at all times. Thanks so much for your time and attention , as always. It's been quite awhile since I wrote my last recipe/ craft type blog post.I just thought maybe it might be helpful if anyone was looking for an easy and fun activity to do with kids this week.